EPR effect – What is Nanomedicine? The American Cancer Society reports trends in cancer death rates among men and women between the years 1930 and 2010 (see slideshow below). Of course, there are fluctuations throughout these years – but it could be concluded that rates of cancer death nowadays are not all that different from 50 years ago. It is clear from this that diagnostic and therapeutic methods haven’t advanced very much in decades, despite the huge advancement in the knowledge of cancer mechanisms and biology. The million-dollar question. Why haven’t we cured cancer yet? The biggest reason would probably be that cancer is complex. It exists in many types (100+ that affect humans) each with many variants and severities. Additionally, two people with the exact same type, variant, and severity given precisely the same therapy would likely result in their bodies reacting in very different ways. For this reason, a single bullet approach is just not going to work. Diagnosing, treating and monitoring cancer will have to be personalisable. One way of advancing toward personalisable medicine is through the incorporation of nanotechnology. Nanotechnology works within the dimensions and tolerances of less than 100 nanometers. The size of this nanomaterial is difficult to conceptualize – the size of a single nanoparticle is to a football as a football is to the earth. Working at this scale has many benefits – to start with, nanomaterials are still small relative to the biological materials that they interact with. 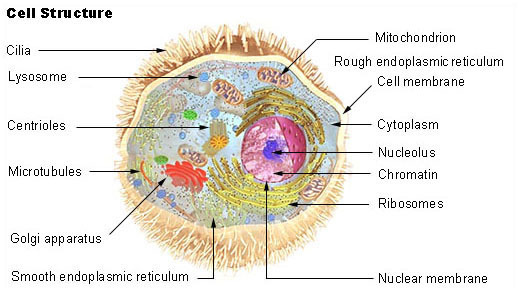 For example, the average animal eukaryotic (complex) cell is 25 µm. That’s roughly 1000 times bigger than a typical 25nm nanoparticle used in nanomedicine. See the infographic below for more size comparisons. Thanks to nanoparticles being comparable in size to this biological matter of interest, we can readily interact with cells, bacteria, viruses etc. This is something that traditional cancer therapy falls short of, hence we get untargeted chemotherapy where patients suffer damage to both diseased and healthy tissues resulting in nausea, hair loss, and other unwanted side effects. tissues or to facilitating therapy like photothermal therapy. In the human body, we have trillions of cells, which have different functions. Inside of these cells is many components which are separated from the cell exterior by a membrane which is semi-permeable. Certain types of nanoparticles can penetrate this membrane better than others – depending on certain factors like the surface charge of the particle, its composition/surface composition, its shape and its size. The illustration above shows how particles can penetrate cells. Nanoparticles penetrate into cells through three pathways: phagocytosis, pinocytosis or endocytosis. For further reading on these processes and cellular uptake, I highly recommend the paper Cellular Uptake, Intracellular Trafficking, and Cytotoxicity of Nanomaterials – Zhao et. al.. So now we know that nanoparticles can penetrate inside of cells to carry out their specific function – but how do we know if they are uptaking in the targeted diseased cells such as cancer cells? Usually, nanoparticles for nanomedicine are functionalised with a targeting moiety – i.e. a special molecule(s) is added to the nanoparticle which has an affinity to a certain cell. Active targeting of specific cells uses targeting moieties which is typically a ligand on the nanoparticle which can connect with a receptor on the cell membrane. When the nanoparticle connects to this receptor site, the cell signals to open a pathway in the membrane – allowing the nanoparticle to enter the cell. So of course, the targeting moiety must be specially selected so that the nanoparticle specifically binds to the targeted cell which has this specific receptor. Thanks to the nanoparticles high surface to volume ratio, it is possible to attach multiple targeting moieties. So nanoparticles can be designed to be even more selective – targeting multiple receptors at once which correspond to a specific cell. For further reading into targeting moieties, Yu et. al. wrote a fantastic paper on this called Targeting Strategies for Multifunctional Nanoparticles in Cancer Imaging and Therapy. Now it’s time for some controversy. Many nanomedicine journal papers consider the Enhanced Permeability and Retention (EPR) effect to be the ultimate evidence to support nanomedicines place in the future of medicine. The EPR effect suggests that more nanoparticles would accumulate in cancerous tumours as opposed to healthy tissues. The concept stems from the way that cancer tumours form. For cancer tumours to grow as aggressively as they do, the tumour cells must sufficiently stimulate blood vessel production (angiogenesis). Vascular endothelial growth factor (VEGF) is the signal protein which is produced to stimulate the generation of new blood vessels and branching of pre-existing vessels. When this signal protein is overexpressed, cancer cells can continue to grow and metastasize with the formation of the newly formed blood vessels (neovasculature). If the production of new blood vessels is not sufficient the nutrition and oxygen supply would be cut off and would halt tumour growth. The neovasculature in cancer tumours is unlike other tumour blood vessels. The endothelium, the most interior layer of cells inside a blood vessel, is badly aligned, and the small pores of the endothelium are enlarged. The smooth muscle layer and innervation (nerve cell supply) is also lacking and the lumen (inside space of vessel) is wider than average blood vessels. Receptors to angiotensin II are impaired, angiotensin II is a peptide hormone that causes vasoconstriction and thus an increase in blood pressure. Tumour tissues also tend to have ineffective lymphatic drainage, which is essentially the bodies waste and debris clearing mechanism. Combined, these abnormalities are thought to lead to unusual molecular and fluid transport dynamics which help nanoparticles spread inside the cancer tissue – while leaving healthy tissues untouched. Seems too good to be true? Probably. So far, this effect has mostly failed clinically and has only been seen in mice apart from a few exceptional tumours such as head and neck cancers. So, it is necessary for those of us who design nanomedicine to not rely on this form of targeting and to incorporate other targeting moieties and stimuli responsive nanomedicine. To read more about the controversy surrounding the EPR effect, this review paper by Deinheir is quite good To exploit the tumour microenvironment: Since the EPR effect fails in the clinic, what is the future of nanomedicine?. So, now we know how nanoparticles can be used in nanomedicine to target specific cells and enter inside them. Next time, I will discuss Nanomaterials used in Nanomedicine. How does nanomedicine actively destroy cancer?